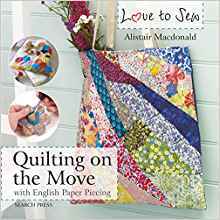 Book Review Quilting On The Move By Alistair Macdonald, softback published by Search Press. 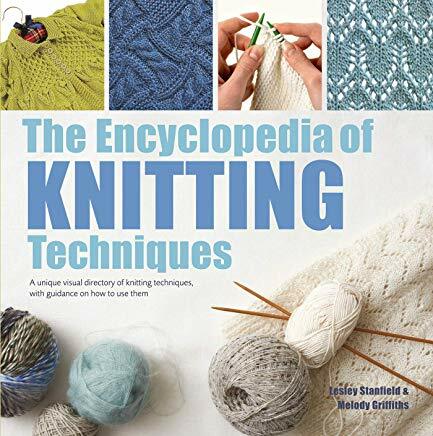 ISBN 971782214489, price 7.99 available in the UK. 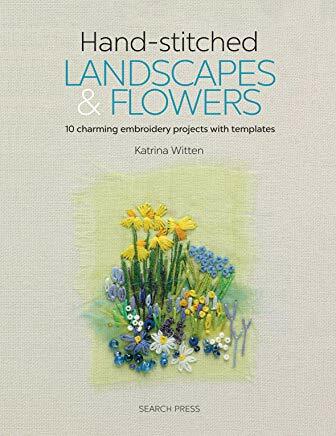 Part of the Love To Sew series, this book is all about English Paper Piecing for hand quilting. There is a brief introduction, materials and tools section, basic techniques, projects and templates without a seam allowance but actual size. There are 18 projects in all, suitable for beginners upwards. The beauty of EPP is that it is entirely portable and easy to do anywhere in a few minutes grabbed here and there. I found the photos slightly on the dull side, and unclear on the bias binding attachment images. The basic techniques section only covers making hexagons, bias binding and inserting a zip. Good projects include a hobby bag (looks more like a pencil case to me), tea cosy, pincushion, make-up bag, man’s scarf, table runner, peg bag, tablet case and so on. All small projects using hexagons and other shapes. There’s a story behind this quilt made to celebrate forty years of falling in love. It includes 40 traditional blocks and 7 keepsake settings. This book will also help you commemorate and preserve the memories of the special events in your life. The 40 blocks tell the story, they are given in ten chapters. Each of the 40 blocks is used twice. You’ll also find General information and Speciality Quiltmaking Skills to help you put the blocks together. The separate quilt settings help you to celebrate different events. Choose blocks that have special meaning to you, to design your own remembrance quilt. 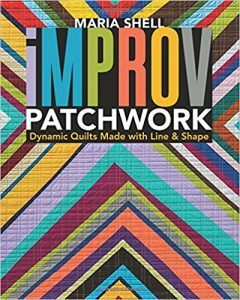 Great diagrams and photos and the quilting instructions are easy to follow. Every block in this quilt is a treasure. Some you might know such as Dresden plate, others you might not have tried. Together they make a superb quilt. Full instructions and assembly are included. I am slowly becoming more and more interested in miniature quilts. I was mesmerised by them at a recent quilt show. It is such a struggle on a domestic machine to wrestle with a gigantic quilt. Yet minis present their own set of challenges. 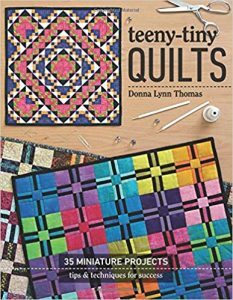 This book presents fabulous images of 35 mini quilts and 12 wonderful projects. You are going to fall in love with doing this. 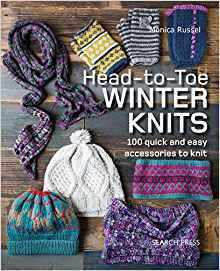 Each pattern has two or three sizes to ease you into getting smaller and smaller. A bit like Alice in Wonderland! Note that if you are making miniature quilts for exhibition, you need to follow the organiser’s instructions on size. 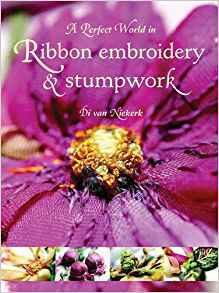 The book takes you through the basic supplies, fabrics and quilting basics. Useful information is found on triangles, on point, nesting, quarter inch perfect seams and finishing. Even if you are a beginner, there is enough practical information here. The projects are also graded for skill level. The projects are a delight, I love the thought that has gone into this book. The instructions and diagrams are first class. When you move onto the next level, it’s all about making the parts smaller. 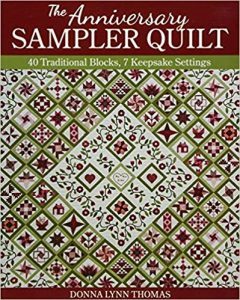 All in all a fabulous primer on mini quilts and one I am happy to recommend. 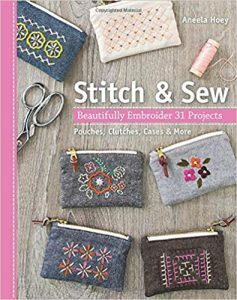 Applique potholders throughout the year with this fun quilting book. You’ll see all the designs at a glance. They consist of fun motifs, flowers, animals and food plus a few seasonal motifs. The gallery shows more designs and possibilities. 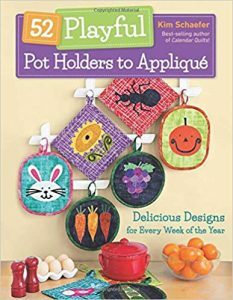 You get three sets of instructions for making pot holders in different shapes. You’ll learn how to do faux mitred corners, make a simple loop hanger. 52 motifs are included to trace.